It is important to have habits, they can keep us organized and have a clean home, but what if your habits are bad ones? 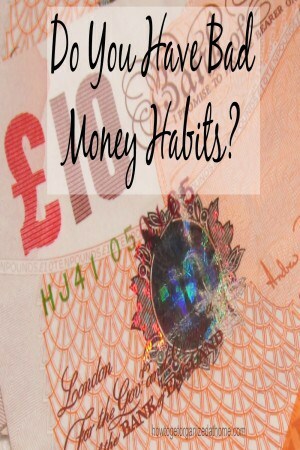 Bad money habits are more common than I would like to admit and I have some too. If we identify these bad habits and put them to shame then it makes changing these habits into good and positive ones a lot easier. However, the hardest part is knowing what is a bad habit and how to change it, how to take those steps to put it right. I have noticed that I am not sorting out my accounts daily, I know shock horror, sometimes as much as three days go by before I check. I don’t know why this bad habit has crept into my life and normally it is just a quick check and all is fine, what is stopping me is fear. I’m afraid that my accounts are in such a mess that it is going to take hours to sort. In reality, this is not true so I am going to take this fear head on and just deal with my accounts daily, like I know I should. I know that this isn’t a really bad habit, but by not checking I am allowing doubt to enter my mind and this causes me anxiety; and there are many other bad money habits that are a lot worse and might need more drastic action. The worst bad habit that you can have when it comes to your money is not having a budget, how do you know how much money you have and what you have left to pay bills? Just the thought of not having a budget sends shivers down my spine. This is a time-consuming problem because you do need to sit down and learn what a budget is all about and how it will work for you. Creating the budget will be trial and error; however, it is a great learning experience. If you have a credit card and you leave a balance on the card every month then you have a bad money habit, if you can’t afford to buy the item then in theory you shouldn’t put the item on a credit card either. Reduce the debt that you owe and don’t increase it further with more purchases that you can’t afford. Paying overdraft charges is a bad money habit, it is important you understand that whilst the bank might like to offer you an overdraft, just in case you spend too much money, it is still borrowing and you are still paying for the privilege of spending the banks money. Try to start budgeting and make sure that your expenses are less than the money you earn each month, this way you will ensure that you won’t go overdrawn. Having a bad money habit isn’t good, it is important you change as soon as possible. 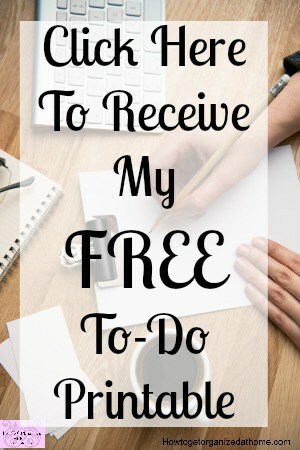 It is easy to spend all the money that you earn every month, it is often just as easy to over spend each month, what many people find difficult is saving money for your future and having a financial goal that you aim to meet. Don’t make it unrealistic or wild, but something that you can focus on and are able to work towards; this gives you an incentive to work for and it can make you want to save because you have an end goal to work towards. Therefore, if you have any bad money habits, it is important to work towards a solution that changes these bad habits for good. So true, I’ve found to my sorrow that banks overdraft fees only create more fees. Pretty soon you’re in a deep hole! This is some great information! Thanks so much for sharing this at Merry Monday, hope to see you again next week! I have developed the habit of checking my bank account each day and update my spreadsheet daily to reflect the bank account. This way I don’t have to log onto the bank more than once a day, even if I want to check a payment or date of payment I can just look at my spreadsheet.